The town is in the grasp of a decided sensation. It is said that there are ghosts operating here. One night last week a young woman living in the northern part of town was accosted and chased by a figure robed in white, but she was not harmed. Several other people have been chased in the district on North street, between North Main and Oak streets. Another rendezvous is at the top of Muttock Hill. Stories have circulated the last few days that there was a ghost in that neighborhood, but little credence was given to them. Most everyone thought some boys were out for fun. It now appears, however, that there is some foundation to the reports. Saturday evening Ralph Caswell was down toward North street and was chased a considerable distance. Last night a crowd went to North street and saw this figure, robed in white, with a flowing veil on its head. It was in the orchard at the Crossen place. When it saw the fellows coming it threw apples at them and they gave chase. It led them the quickest they ever traveled, up and down hill and over a high fence into the woods. It escaped. It is generally believed that it is some man dressed up to have some fun. The fun will turn if he gets in the way of those after him. The ghost is still the whole thing among the young and adventurous element of Middleboro. The young men say they are going to catch him. A crowd organized last evening, and shortly after 7 went to the scene of the ghost's hilarity. It broke up into parties of two and waited in the woods. The ghost did not show up. After waiting till about 10 the searching party gave up its job. Whoever or whatever is making this trouble is sure to come to grief if it continues. The matter has gone almost far enough in the minds of many, and they are determined to know who is responsible. This is not the first occasion of ghosts in the Muttock neighborhood, one of the residents says. On previous occasions there have been seen figures dressed all in black and traveling on all fours. At other times it was erect and dressed in white. It was not an animal, and what it can be, if not a man, is a question. 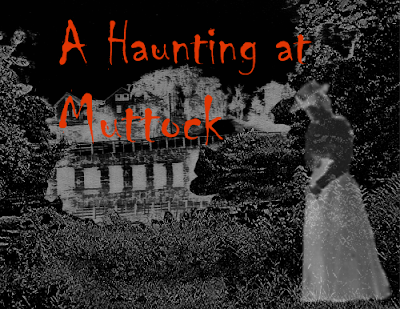 Although most of the people living in Muttock sincerely believe there is something prowling around in the garb of a ghost, they fear nothing, claiming that no harm will come from it. The searchers are determined, and will keep up their work until they find out who is playing ghost or until the disturbance stops. 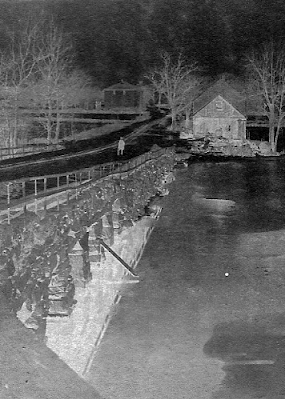 After spending two nights in an unsuccessful attempt to locate the Muttock ghost, a band of young men started out again last evening, but the did not have better luck. There were two parties composed of youths from the center of town and others were from Everett street. The Everett street crowd started at the lower end of that street and the boys from the center entered the woods just behind the Crossen place [on North Street at the top of Nemasket Street]. They split into parties of two, each armed with a four-foot oak club, and prowled around the woods. After two and a half hours' search they went home unrewarded. The clubs last evening supplanted the revolvers and hounds the searchers had Monday evening. When they got through hunting the ghost they could take home the precious pieces of wood and be assured of a few minutes' warm, cheerful fire. The party from the center was passing through a yard on North street and was stopped by a woman who said the spook was out Monday evening, although it kept out of the way of the searchers. The residents of that section seem to be divided on the question of ghosts. One young man, Bert Amsden, says that as he was going home the other evening he saw a white thing out in the field. He fired four shots at it and his brother fired once. Apparently they hit something, as there was a scream and then the figure got away in pots haste. Miss Lizzie Landgrebe, who lives near Amsden, discredits the statements regarding ghosts, and does not believe there is any such thing there. It was stated last week that she and her sister were chased. And she strenuously denied it. The searchers last evening included: William Murray, William Scanlon, Bolles Dustin, John Harrington, Eugene McCarthy, Leo Allen, William Brawdrex, Barney Chandler, John Macomber, Samuel Osgood, Eugene Curley, Thomas McManus, Frank Elliott, Mark Snow and Ralph Caswell. The ghost sensation is at a low ebb. The spook has not been seen for two days. Even though it has not been around lately, it is not thought it is out of business. The ghost, in fact, was "out of business". No further sighting of the figure, nor who was ultimately responsible for the diversion in 1902, was ever recorded. Muttock, c. 1900, composite photograph, 2009. During October, 1902, an apparition in white was seen by several witnesses about Muttock frequenting the wooded area about North and Everett Streets. While residents remained both skeptical of and unperturbed by the suggestion of spirits, they were unable to capture the perpetrator of the "ghostly" visits. Muttock, photographic negative, late 19th century.